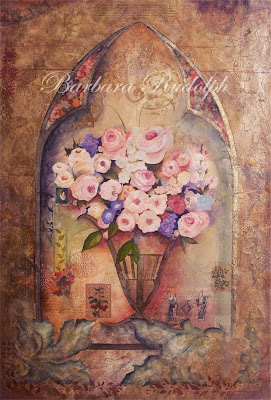 Barbara Rudolph Fine Art: Old World Style Floral - "Autumn Song"
Old World Style Floral - "Autumn Song"
This is a mixed media oil painting that I did on artists cotton rag paper. The paper is 44" x 30" but with the elegant frame, it measures 51 1/2" x 38". (There is glass on it) It has an "old world" feel to it and includes lots of interesting little treasures under the texture of the painting, like pieces of old maps, script, gold leaf, and of course a beautiful postage stamp from Rome. This painting has many layers in the underpainting before I began to paint the bouquet of flowers. I actually did this one quite a number of years ago, but someone suggested that I post it. I have had it hanging in my home now for some time and am ready to part with it should it find the right home. HUMMINGBIRD - Broad billed "Ode To Joy"
TRAVEL JOURNAL - "The Three Graces"
TRAVEL JOURNAL SERIES - "Algerie"
PARISIAN THEME - "Memories of Montmartre"
STILL LIFE - "Nana's Cup"
TRAVEL JOURNAL SERIES - "Botticelli Venus"
CONTEMPORARY ICON SERIES - "Resting Angel"
FLORAL SERIES - "The Three Graces"
BIRD SERIES - "Happy Day"